This almond-y chocolate treat claims to be ready for the oven in 15 minutes. 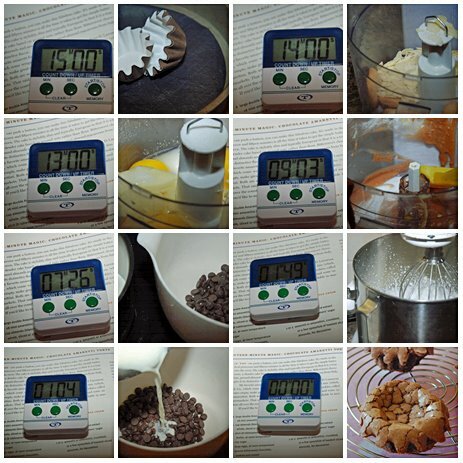 I tested this assertion and set my timer (after getting the ingredients prepped and taking the required mise en place photos, of course). Because I baked individual tortes, they were ready after only 15 minutes in the oven. A little while ago, I took a foodie field trip downtown to one of my favorite kitchen stores in Ottawa called Domus. Domus has been in Ottawa ever since I can remember. It used to hold the largest cookbook collection, then moved to a new location and now houses a wonderful kitchen store and restaurant. I found the individual paper liners that I used for these mini tortes at Domus and am looking forward to trying the vanilla paste. You can find the recipe for 15 Minute Magic: Chocolate Amaretti Torte in the book Baking: From My Home to Yours by Dorie Greenspan or here. To see how the rest of the TWD group fared with this week's recipe, click here and then click on each blogger! Thanks to Holly from Phe/MOM/enon who chose the recipe for this week. This was a speedy but elegant dessert. If you love almond and chocolate, you'll love this dessert. You'll also love how quick it is to make. Four Star Chocolate Bread Pudding on pages 410 and 411 chosen by Lauren of Upper East Side Chronicle. I love your pictures of the timer next to the step you were on as the clock counted down. I really liked the speed of this dessert (minus the time spent looking for cookies!). Yours looks beautiful! I want a large food/kitchen store in my area. I just don't think that will ever happen. Your mini tortes are just to cute. These are just adorable. Nice job! cute!! I love the little tiny tortes! 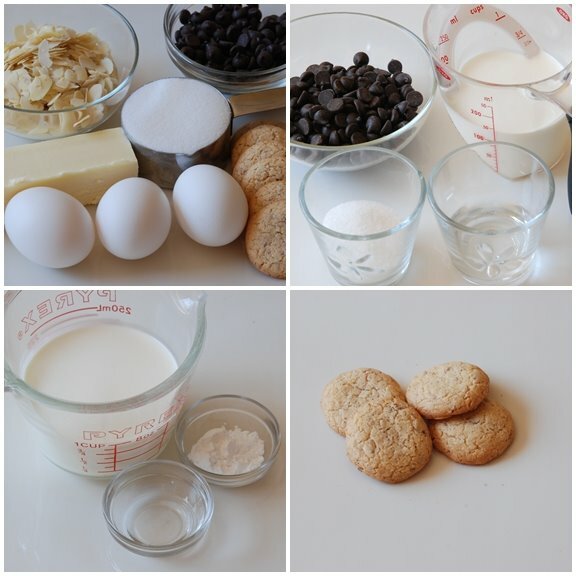 :) Love the step by step instructions with the timer! Great idea to do the timer; love it! Domus sounds like a wonderful store. 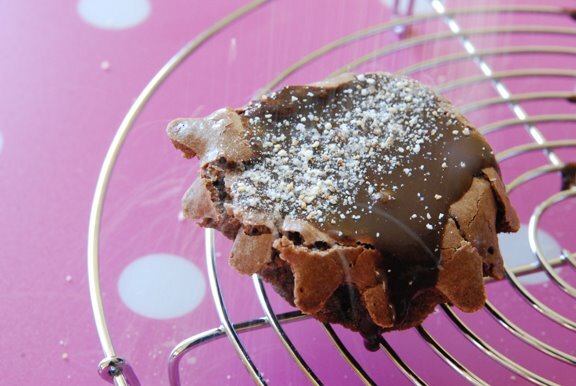 your mini tortes look fantastic with the chocolate ganache streaming down the sides. Love the pics with the timer. What a cute little store! I'm jealous. Your tortes look adorable! Glad you liked them. Scrumptious! 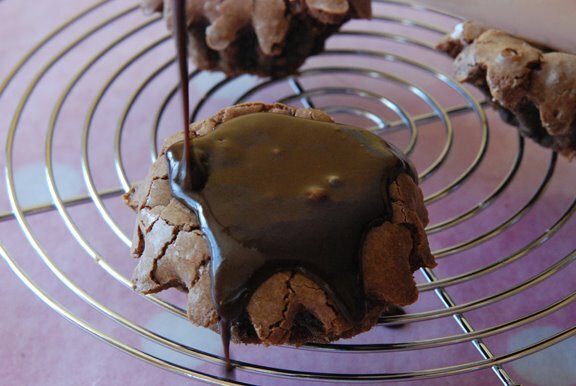 Love the timer shots, and the ganache drizzle, mmm. Love the little cakes! I guess I am the only one who took hours to make these. What a great store, I am going to go take a look at their website, thanks! Wow, your individual tortes look fantastic! I love your pictures too! I really wish i had a shop like that near me. I always look forward to see what you're going to bake your desserts in- always so pretty! Your interpretation of this recipe is divine. Thanks so much for posting. I would be in big trouble if I lived near this store...I love the brioche tins and the matching liners...and I loved this cake! The idea of making minis is very appealing. Very, very pretty minis Shari! Hum... you kinda had to cheat a bit with baking time though, huh? What fun with that timer...it took me forever to unwrap all those little cookeis! But, that said, this was a very fast recipe. I love the little ones you made...I am going to need that option when my boys leave home...right now, those are probably bite size to growing boys...LOL! 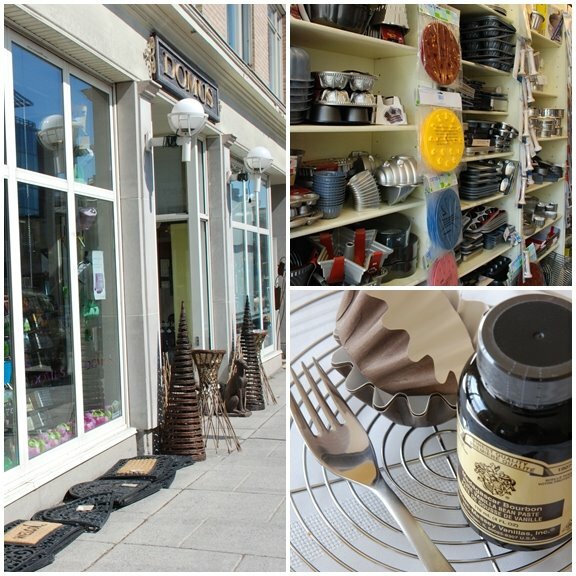 Oh, how I love to see photos of kitchenware shops...how fun was that? Thanks for taking us along...and I am excited about your purchases...very nice. Great job on the little tortes! Reminds me the Geico or some insurance commercial where in 15 minutes you could have saved a billigion dollars. However, yours looks more realistic for the average person. they look great--love the crackly tops! and way to get it prepped in just 15 mintues! The timer pictures are FABULOUS! You must have a tripod right? I need a tripod. I love seeing process pictures like yours. Your little tortes are adorable. Great job! How fun! Now we have proof that this is indeed 15 minute magic. Love your little tortes, those wrappers are adorable. P.S. I bought some of the same vanilla bean paste recently and LOVE it! Those look soooooo delicious. And I must make a trip to Domus sometime soon - I haven't been there in years. the paper liners are so cute. they look like those little brioche tins! OH! I have those little shells. I need those paper liners. Lucky you to have such a great store close by. Those look good. First of all, Domus looks like an amazing store, oh, and yeah, your torte look AMAZING, too. Just delicious. I'm all about the almond and the chocolate. What a perfect, fudgy combination. Oh those tortes look deeelicious! This recipe is just in time for mother's day too. I also loved your photos with the timer... great idea!